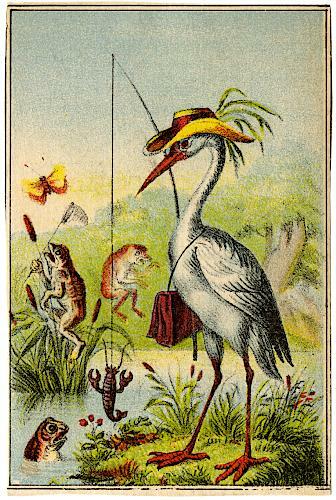 In this 1880s trade card there’s a group of creatures at a pond. In the foreground stands a long-necked bird, a crane, wearing a hat with feathers and carrying a leather satchel. The ird has caught a lobster. In the background a frog chases a bitterfly with a net, a monkey dances, and another frog swims.